Please download the paper form and return it to the office. 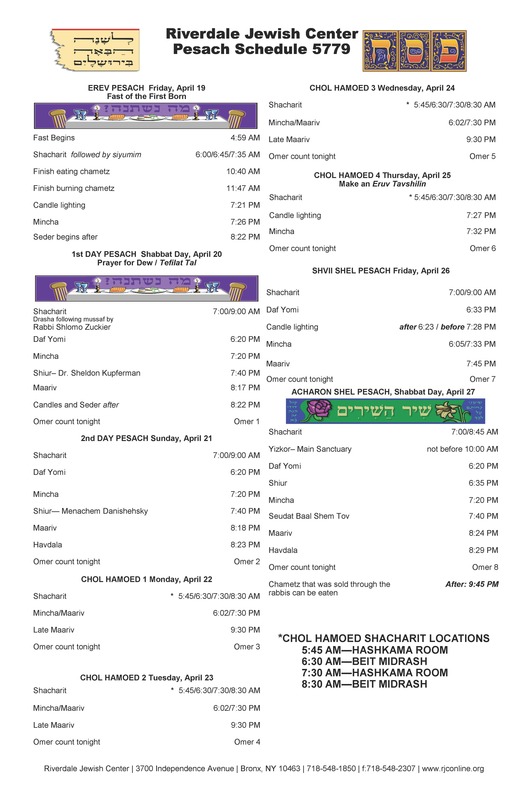 Rabbi Genack conducted his annual seminar, “How to prepare for Pesach,” with the latest information on Passover products as well as refresher tips on preparing the home and kitchen for the holiday. If you missed the Shiur you can view it by clicking on this link. Rabbi Genack will deliver the Shabbat Hagadol Drasha next Shabbat, Parshat Metzora, following Musaf in the Main Sanctuary, at approximately 11:00 am. Yom Hashoah Program, "The Rescue"
Mazal Tov to Lou Bravmann on the engagement of his granddaughter, Alyssa Berlin, daughter of Carol and Chuck Berlin, to Joe Boris son of Shirley and Adam Boris of Hewitt, NY. Also, to the aunts and uncles Judy and Uri Kaufthal and family. Mazal Tov to Michal and Jeff Feldman and sister Liana on the birth of a baby girl, Amalia Rachel. Mazal Tov to Janice and Harris Cutler on the engagement of their son Geoffrey Philip to Elana Miriam Sand, daughter of Arlene and Michael Sand of Teaneck, New Jersey. Mazal Tov to Naomi Diamond and John Cohen on the birth of a baby boy. For more details, or to sponsor a kiddush, please click here! Have you noticed something that requires repair or maintenance attention? Please use this form to let us know so that we can keep our building running as optimally as possible. Thank you!